This app exports all your messages from the messaging app (or better the internal database) to a text file with tabulator seperated fields for: timestamp, human readable date and time, service (i.e. sms, gtalk,...), inbox/outbox, sender, recepients, message. This file is saved in the usb partition and can be send as attachement per E-Mail (from the app menu). It should be easy to import that file to Excel. This way one can backup and/or export all the sms and also IM messages from the device and keep them, even if webos goes down or the palm backup server dies someday. This app works for webOs 2.x and 3.x. It will NOT work on webOs 1.x. webOs 1.x users should have a look at the Save/Restore app. from a root-terminal on the device (the command line way does not require a device reboot). Just press "Do Export" and wait for the spinner to stop spinning and the message "All went well". If you get a "Permission denied"-Error, please execute the command line from above or tripple-check if the patch is installed and that you rebooted the phone after the patch installed. After that hook up the device to an USB port and copy the created file or use "Mail message" from the app menu and e-mail the message to yourself. You can change the filename in the text editfield. But there is no real reason to do so. 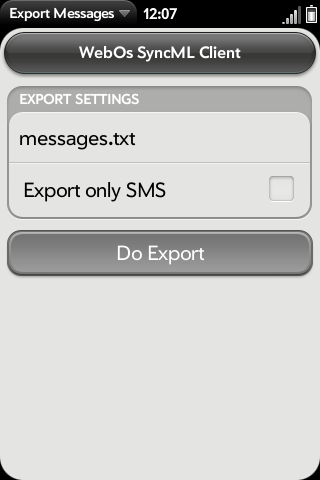 If you select "Export only SMS" IM messages are ignored. If you run into trouble with the service lockign up, you can try that. You can tick "Export as XML", which will create an XML file which can be imported on Android devices, see the forum thread or here http://android.riteshsahu.com/apps/sms-backup-restore . If the service locks up, you'll have close the app and wait a minute or you can try "Reset service" from the app menu. - fixed issue with address not correctly quoted. - Circumvented issue with call-stack exceeded. - Added quoting of characters not allowed in XML. - fixed possible issue with SMS with neither from nor to address during XML export. - explicitely excluding deleted messages. - new lines and tabulators are now filtered from message text, because they break Excel import.